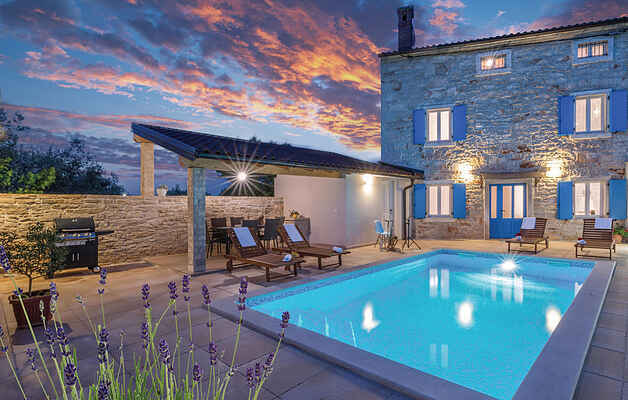 In the small village of Peruski you will find this authentic Istrian holiday home, renovated and adapted to the modern way of life. The beautifully and with a lot attention to details furnished interiors will provide you a pleasant holiday. On the fenced plot is the refreshing pool located and the covered terrace which is ideal for socializing and enjoying the dishes prepared on the barbecue. The lowest ceiling height is approx. 100 cm. The nearest beaches can be found in the village. Visit the nearby town of Pula, which will delight you with its many cultural and historical attractions.